Have you ever thought about volunteering or giving back to our veterans who have been touched by war but don’t have any idea how to help? 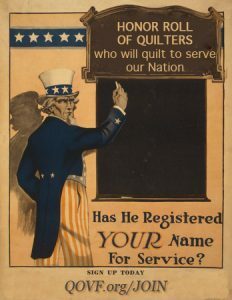 Quilts of Valor Foundation offers ways that you can sew to serve our veterans and say “Thank you for your service, your sacrafice, and your valor.” A handmade quilt, stitched with love, can offer comfort like nothing else can. You don’t need to be part of a group to donate, but there are several officail QOV groups established across the US, click here to see if there is a group near you. This is a really wonderful way to give back with some of your sewing time and talent!